This is my third guide and I finally know my way pretty damn well around Hackintoshes. My latest build has Mavericks working almost perfectly (very minor graphical glitches and no iCoud). I decided to make a guide because there are lots of AMD users dying to get their hands on Mavericks working properly. Before before we start, please don’t hesitate to ask any questions. This guide isn’t anything perfect so I do understand if you get lost. I’ve tried my best to correctly put everything you may need in. I will be able to help a lot though so don’t worry if you get lost. This build involves 2 hard drives, OS X being on one and Windows being on the other for dual booting. I have not yet been successful with OS X and Windows on the same hard drive. If you have only one hard drive you can follow this guide to install OS X and then maybe try the dual boot yourself outside the guide. As I said, I don't know how to do this so won't be able to help at all. The reason I use two flash drives is just to save my skin. Hackintosh is not perfect so tiny things can really mess it up. I make a flash drive that is identical to the first one with the installer on. This is just incase anything goes wrong with the first one, and this second one I keep in a safe place in case my Hackintosh messes up for any reason. Its entirely up to you to use the second one, it is not needed for the installer at all. Also I uploaded the kernel to Zippyshare cause I honestly cannot remember when page I got it from from THIS thread, and it would take forever to find that again. I call this part easy since it uses MyHack. I did NOT use MyHack, but everyone has been using it to get Mavericks set up so far. I didn’t use MyHack cause when I did this, the beta wasn’t out yet so it did not work with Mavericks at all. You can follow either path. MyHack is easy to use and ‘should’ work. The second part is slightly harder since I can’t remember what I did exactly. Put your flash drive into the Mac and launch disk utility. Format the flash drive with 1 partition, name it anything but make sure its one word for easier access in terminal. Also set the Partition Scheme to GUID, by clicking options near the bottom of the partition screen. Once that is complete you can close Disk Utility for now. Launch MyHack DMG and put the app into your applications file. Start the application. It will ask you to select what you want to create. 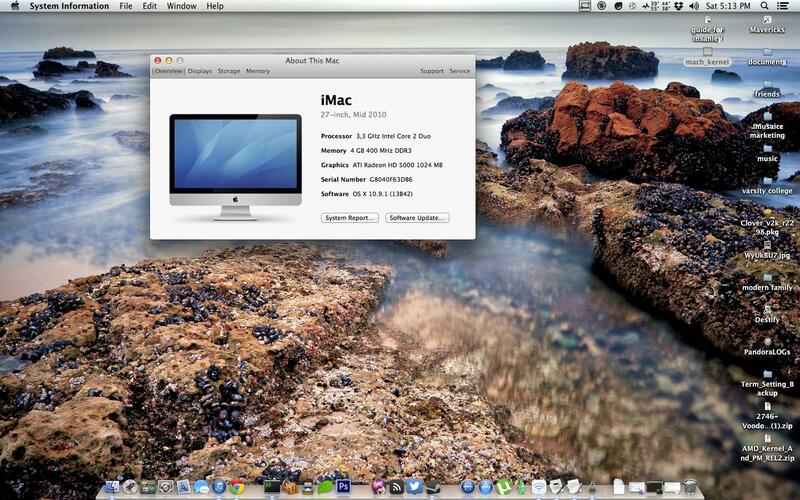 Select install and then select OS X Mavericks (10.9). Then select the USB and it will create a bootable USB. It will ask you a few things before you finish, just select YES or NO, depending on your build. Now go to your system and launch the bios. Make sure it is set to boot from the USB stick you just created and also make sure the SATA mode is set to AHCI. I don’t know exactly which ‘section’ has the SATA mode. If all is okay your USB should boot! Press F8 and any key, like space or something, to bring up the chameleon screen. It may also just have very basic text saying ‘Darwin Bootloader’, which is fine too. Now we need to do the flags. My flags will be different to yours if your system is different, they are a good place to start though. For the beginning ALWAYS boot with “-v” and “-f”. This enables verbose mode so you see EXACTLY what is happening during the boot process. It also forces the kernel to ignore the kernel cache so it also loads all the kexts properly. To diagnose booting problems (if it does not get to the installer) please please please post A PICTURE of exactly where it hangs / panics. This will help me / other people get it to go passed that point. If all is okay you should get to the installer! Launch disk utility by clicking on “Utilities” in the menu bar. Format the hard drive you want Mac installed to with a ONE WORD name (its much easier for further steps). Make sure it formats as MAC OS Journaled (extended), and GUID partition table. You can close disk utility and start the install. Be careful not to select the wrong hard drive to install to. Now you can go ahead and restart. Go back into your bios utility and choose to boot from the hard drive you just installed Mac to. If everything went correctly do the same as before, by hitting F8 and spacebar a lot, and it should load the chameleon screen. Enter the same flags you used for install. The same rule applies here, if you hang anywhere / kernel panic just post a picture. It may also hang at “IOBluetooth” again. If all goes fine, you will be on your Macintosh! Congratulations! We just need to do a bit more before we can fully use this puppy. Load up system profiler by clicking the apple sign in the menu bar, and select “About this Mac”. Then select “System Profiler” from the dialog. IF your CPU clock is something like 3MHz then we need to replace the System kext. If not, then you’re set (but you can replace it anyway for safe keep). To do this, launch kext utility and put in your password. Then drag and drop the “System.kext” from the "AMD _Kernel_And_PM_rel2" zip folder. Wait for it to finish and then reboot. Launch Chameleon Wizard. Click “org.chameleon.boot.plist” and check any boot flags you need. You can take off “-v”, but for the time being while you install a lot of things, rather keep it on. Also don’t install any themes until you have everything properly set up. Make sure “GUI” is ticked and “Timeout” is greater than 1. Once complete you can save and quit that app. You can now reboot just to check that all the boot flags are working correctly. If so, you can move onto install VoodooHDA if you don’t have sound working already and anything else that you may need specific to your system. As I said in the beginning of this guide, if you have ANY problems please feel free to ask my anything. Post pictures if its anything boot related as that will help me a load to diagnose your issue. Also at the end of this guide is some contact information if you feel the need. I do prefer you asking question publicly as some people may have the same problem as you. The reason I call this part difficult is cause I cannot EXACTLY recall what I did. This is me literally talking out of memory. I am going to re-do what I did, however, as soon as the Mavericks install finishes downloading (again, South African internet is a joke). I will obviously help out as much as I possibly can. Okay lets get going. For these few steps you are going to need that working Mac. Launch the Pandora.app you just downloaded and select Pandora Installer. It MAY ask you to install a specific theme. Just hit 'y' and enter. It will ask for your sudo password so enter it. The machine will restart so make sure you don't have anything running that needs to be saved. Pandora runs in terminal so don't be startled when that opens. Type 1 in the terminal. Pandora will now ask for your sudo password again, so just enter it. Then type 1. Then type in no. Then type 1. Then drag and drop the OS X 10.9 DMG onto that window. Pandora will now copy the contents of OS X 10.9 to the flash drive. I don't know the steps that follow this step (I need to re-downloaded the Install DMG). It was pretty simple though, but feel free to ask if you get lost. Copy the AMD kernel you downloaded to the root of the flash drive. It will replace the original mach_kernel so don't worry. Once that is complete we are almost ready to boot! Before you boot, place any kexts that you need for your device in a folder called whatever you want in the root of the flash drive. Also place the VoodooHDA PKG and 'AMD Kernel and REL2.zip' there. This is so you can install them once your system is properly installed. hello, I have a question, I tried to install Niresh's maverick amd, it installed well but after installation, when I boot the computer, It ask me to chose my country, then keyboard, name password... And the problem is, before I finish these installation setup It suddenly hang ... So I can't access the desktop ... After some googling, some suggest to put the AMD-Kernel on the USB and I don't know how to do that. Can you help me on this issue please.